We’d love your help. Let us know what’s wrong with this preview of Return To Lemuria by Richard Gradner. Billy Bayer has just alerted the mysterious descendants of an ancient civilisation. A civilisation that claim responsibility for every major historical event. Billy is taken prisoner by a secret organisation after conspiring against his mob-boss. He is taught how to tap into his extra-sensory abilities and his life changes forever. This newfound power gives Billy the coura Billy Bayer has just alerted the mysterious descendants of an ancient civilisation. A civilisation that claim responsibility for every major historical event. Billy is taken prisoner by a secret organisation after conspiring against his mob-boss. He is taught how to tap into his extra-sensory abilities and his life changes forever. This newfound power gives Billy the courage to confront his captors and challenge their age-old ideals. To ask other readers questions about Return To Lemuria, please sign up. Return to Lemuria is a fast-paced and action-packed adventure story with something extra. In addition to the thrills and spills it has a psychical dimension which is unusual for stories of this type. As well as flying across continents, penetrating remote jungles and climbing volcanoes, characters make frequent and vivid journeys into psychic realms, which are richly described. These are much more than just interludes in the action; a considerable amount of the plot’s progress depends upon the c Return to Lemuria is a fast-paced and action-packed adventure story with something extra. In addition to the thrills and spills it has a psychical dimension which is unusual for stories of this type. As well as flying across continents, penetrating remote jungles and climbing volcanoes, characters make frequent and vivid journeys into psychic realms, which are richly described. These are much more than just interludes in the action; a considerable amount of the plot’s progress depends upon the characters’ encounters and experiences in these spiritual dimensions. I liked Richard Gradner’s rationale for some of the unexplained and curious coincidences in our planet’s history and mythology and his inclusion of spirituality in various forms; it gave the book a wider, metaphysical appeal than I had expected. His style of describing violent and sexual encounters, however, was refreshingly no-nonsense although never gratuitous. I wish he could have given more depth to his characterisations. Unfortunately I found the characters to be rather two dimensional, and although Billy and his gang are likeable rogues, I couldn’t get away from the fact that they were low-life drug traffickers bemired in all sorts of criminality. David and Mala, on the other hand, were too good to be true. Unlike many writers using two story threads to bring his plot together, Gradner doesn’t interweave them. We get one thread in part one, then the other in part two. Unfortunately, this did mean that when the two did get tied together in part three, I’d lost track of how I’d left things at the end of part one. The last third of the book seemed hurried to me, with several typos, characters’ names being mixed up etc. However, all in all, and unusual twist on the Sci-fi fantasy adventure, and worth the read. There is something about settling in for a long plane ride that makes my brain crave a good book. I recently read and thoroughly enjoyed ‘Unicorn’, the second novel by Richard Gradner, and oh how glad I was that I packed his first novel, ‘Return to Lemuria’ for a recent long haul flight. It was the perfect book for hours of quiet, sustained uninterrupted reading time. The plot is creative and unpredictable with solid writing. Gradner shines at describing extra bodily experiences, mind reading abi There is something about settling in for a long plane ride that makes my brain crave a good book. I recently read and thoroughly enjoyed ‘Unicorn’, the second novel by Richard Gradner, and oh how glad I was that I packed his first novel, ‘Return to Lemuria’ for a recent long haul flight. It was the perfect book for hours of quiet, sustained uninterrupted reading time. The plot is creative and unpredictable with solid writing. Gradner shines at describing extra bodily experiences, mind reading abilities and astral experiences as well as at building new worlds in a beautifully descriptive manner. The book is divided into four parts. In the first part the reader is introduced to the Lemurians, and in particular 16 year old Mala, her almost 18 year old twin brothers, Cuthru and Asbeth, and their parents, King Andor and Queen Shaia. The Lemurians lived 12000 years ago, in a time where everyone and everything was equal and in abundance and where mental superpowers were part of everyday existence. During the second part of the book, the reader is introduced to particularly three main characters, Billy, Kaimi and Kisha, who start their adventure in New York. We follow their action and passion packed adventure via Barbados and Cuba to Mexico. Here Gradner clearly did his research very well as descriptions of architecture and culture were accurate, fresh and interesting. I did however feel slightly lost and thrust into part three of the book, but quickly got the just of it and this part of the book eventually became my favourite part of the whole novel. Part 3 is a completely unique love story where Mala meets anthropologist, David, in the Brazilian rain forests and where they travel to Hawaii together to find Mala’s roots. Here Gradner excelled at describing the soul-purifying hallucinogenic experiences David has when he uses Ayahuasca. Action, adventure and gritty realism are exist alongside the metaphysical and fantasy in Richard Gradner's Return to Lemuria. Skilfully crafted, I especially loved the descriptives contained in the pages of this book . We hear of ancient Lemurians who travelled the lines of energy between the planets - 'The Earth was created with an invisible web of light lines called the gravitational magnetic grid. Some call it the crystalline matrix'. 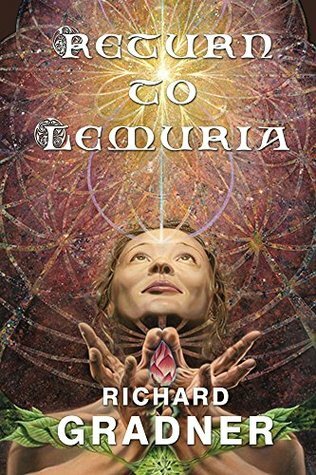 With interesting characters, situations and a fast moving p Action, adventure and gritty realism are exist alongside the metaphysical and fantasy in Richard Gradner's Return to Lemuria. I have received this ebook from the author in exchange for an honest review! The synopsis of this book caught my attention and I was very much looking forward to reading this book. I am sad to say that it is not one of my top favorite books. I mean it wasn't bad, it was just okay. I didn't really love it because it had some flaws. I felt like I didn't get the feels when I read this book, I wasn't as excited to finish the book as I had with other books I read. Although I did finish the book and it I have received this ebook from the author in exchange for an honest review! The synopsis of this book caught my attention and I was very much looking forward to reading this book. I am sad to say that it is not one of my top favorite books. I mean it wasn't bad, it was just okay. I didn't really love it because it had some flaws. I felt like I didn't get the feels when I read this book, I wasn't as excited to finish the book as I had with other books I read. Although I did finish the book and it was an okay read, I just don't feel like it's my cup of tea! I give this book a 3 Star Review! I had to really focus from the beginning to the end simply because I want to know how the author twisted the Lemurian story in this book. I was indulged momentarily for it uses characters from the past and future, so it's easy to comprehend. It always reminds readers that no matter what, goodness will prevail. I felt revived for the result of the story's end. Felt like the beginning has yet to come. This book has an interesting story, fast paced and it grabs you. However I was a bit concerned about the way it moved from past to present. It took a fast story and pretty much slowed it to a crawl until you figure out whats going on here. Then there is part two, which is very much a separate story for awhile... until it meets the first part. Another slow down. Confusing just to write about it. Overall, I enjoyed this book. The charaters are well developed and enjoyable. The plot is different and keeps you guessing. However, the end of the book seems rushed as it wraps up in about 10 pages. I look forward to other books by this author. This book is full of story line. It flashes back and forth from past to future creating a full story of thrills and characters full of life. If you love fast moving plots this is for you. I thoroughly enjoyed reading this book. There was nothing to dislike. I would recommend this to anyone who enjoys reading this type of book. I thoroughly enjoyed reading this book. I would recommend this to anyone who enjoys reading this type of book. I would like to read more of your work. Thanks for the experience. I received a free copy, through LoP on Goodreads, in exchange for an honest review. Mobsters, criminals...aliens? Not something that you would think would go hand in hand, but Billy discovered something that most people don't know - there is a mysterious alien race that claims they are the ones that have a hand in all major historical events, throughout history. Sounds a little too fiction to be real, until he's taken prisoner one day and somehow taps into this unknown power, deep inside himself - something alien to him, but not others. Now, with this knowledge and new power, he's on a mission to discover what he can about what he is and how he can use this to help mankind. This is a very interesting and different kind of read, in regards to tackling "creation" in a new way. I liked the idea of lemurians and all and thought it was incredibly imaginative. The beginning had me completely drawn in and it was tough to put it down. The beginning was first explaining the history of it all, and then focused pretty much on the perspective of the "bad guys". I was very happy when I got towards 2/3rds of the book and finally the heroes emerged. The book is written very well, j This is a very interesting and different kind of read, in regards to tackling "creation" in a new way. I liked the idea of lemurians and all and thought it was incredibly imaginative. The beginning had me completely drawn in and it was tough to put it down. The book is written very well, just has a few errors along the line, like Mala referring to her brother Asbeth as her uncle at one point. But overall the plot was very well developed and had a good pace to it for the most part. I was torn about some of the main characters, since it was the bad guys that were focused on for most of the book. The characters however were well developed and in case of the bad guys, and there were shades of bad in this book, were easily disliked. Billy was kind of on the verge and not fully a bad guy, so I didn't hate him as much. I definitely was a fan of Mala and David and very happy when they finally came long. Overall this was an enjoyable read and I can recommend it to fellow readers. Wow! What a ride! I think I need to read this one again. There is so much to take in. The story begins on the continent of Lemuria over 12,000 years ago and then continues in New York, Barbados and Mexico. It's filled with everything from telepathy to ancient civilisations, to lost tribes in Brazil with Shamans taking Ayahuasca and so much more. The story is filled with fast-moving action from the get go. The author sure knows how to pack it in. The pace is fast and the story is well researched. Wow! What a ride! I think I need to read this one again. There is so much to take in. The story begins on the continent of Lemuria over 12,000 years ago and then continues in New York, Barbados and Mexico. It's filled with everything from telepathy to ancient civilisations, to lost tribes in Brazil with Shamans taking Ayahuasca and so much more. The story is filled with fast-moving action from the get go. The author sure knows how to pack it in. The pace is fast and the story is well researched. The descriptions are vivid and the characters colourful. I enjoyed how imaginative the story was and the visual imagery the author was able to convey was excellent. I did not care for how disconnected the two story parts felt. I know the intention was probably to enhance the readers understanding of the Lemurians as well as develop the heroin but I never felt like the separate stories ever really clarified themselves together. Richard Gradner is a Director at Mustard, a creative and digital agency. He was the first Red Bull Marketing Director in South Africa and has a passion for brands and branding. He is also the author of Return to Lemuria, Unicorn and Servant of Memory, all stories that fall under the mythical fiction genre. Richard is an ex-Kung Fu and Tai Chi teacher, with a deep connection to all things spiritual Richard Gradner is a Director at Mustard, a creative and digital agency. He was the first Red Bull Marketing Director in South Africa and has a passion for brands and branding. Richard is an ex-Kung Fu and Tai Chi teacher, with a deep connection to all things spiritual. He lives life to the full, maintaining a healthy mind and body through the daily practice of Yoga. To find out more, please visit richardgradner.com.